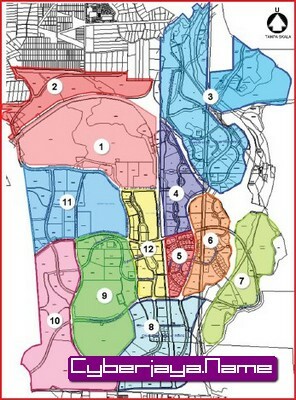 CYBERJAYA is now divided into 12 zones, similar to the precincts in Putrajaya, for easy identification and postal delivery. According to Sepang Municipal Council (MPSp) president, En. Azizan Mohd Sidin, the Cyberjaya Rezoning Structure Plan (CRSP) was passed during the council’s One-Stop-Centre (OSC) meeting held on Nov 26, 2008. CRSP was proposed to enable easy identification and for postal delivery. MPSp will be putting up gantries which will include direction signages at strategic locations to remind the Cyberjaya citizens on the CRSP. As an example, the MPSp headquarters, which is located in Cyber 1, would share the same direction signages as the Community Clubhouse and the Cyberpark. The MPSp address would henceforth be Majlis Perbandaran Sepang, Persiaran Semarak Api, Cyber 1, 63200 Cyberjaya Selangor Darul Ehsan. Cyber 12 (Neo Cyber, D’Cassia Apartments, D’Melor Apartments, Bus Terminal, CBD Perdana). Click here to download large map of Cyberjaya Rezoning Structure Plan (CRSP) and with no watermark.